A little nautical inspiration for your Wednesday morning! Love this simple and put together outfit! 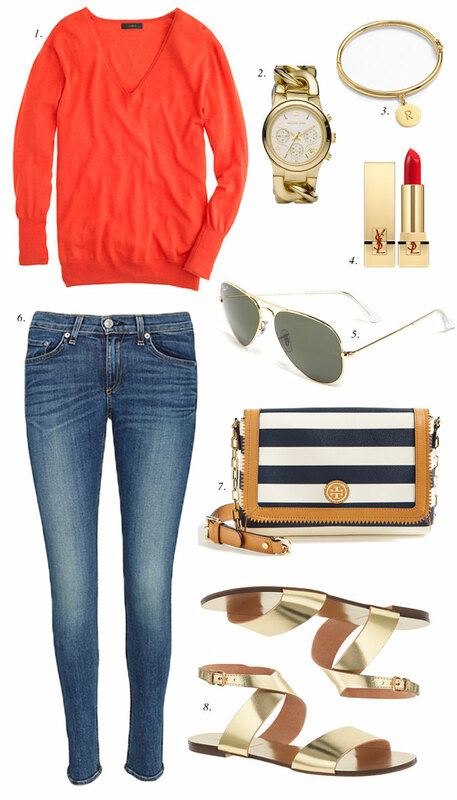 Great picks to style a great casual nautical look. Loving that bag!! I have been eyeing it for some time now, it’s perfect for summer! Love this look! Perfect for spring! These sandals are so cute. Love a good nautical look for Spring! These pieces are all so perfect! Adore that Tory Burch bag! Gorgeous choices! I love that you always wear a bright lip… I usually do the same on my blog, Palm and Peachtree! Can’t wait to check out the YSL color above. Thank you for the fab ideas! That striped bag is amazing! I’m always a fan of the nautical vibes! Loving the sweater and sandals! I love this mood board so much! Those sandals and that Tory Purse is amazing! Love the whole look – especially the Tory Burch bag & J.Crew sandals! I always love nautical pieces! That orange would look so good on you! That Tory Burch crossbody bag is everything!!! I love it! Love these picks! So classic! The watch is fabulous. Great casual look. Perfect for the busy mom on the go, yet fashionable and chic. I love these picks! I’m obsessed with those sunglasses and the watch – gorgeous! Loving everything about this look! Especially the sandals! Very summery! Love the red v-neck. It would also pair nicely with white toothpick jeans and striped espadrilles for another take on nautical. Great orange and gold look ! I can picture you wearing this looking effortlessly chic. The sweater and the sandal are gorgeous! Lovin’ the Tory Burch purse. Perfect pieces for some nautical outfits! That crossbody bag is amazing! I’ll never say no to nautical! Love the red sweater! LOVE the stripe TB bag! Any advice or feedback would be great! Ahh! This makes me so excited for Summer. And loving that Tory bag! I finally bought the YSL Rouge Pur Couture #13 because of how great it looks on you! I’ve really been into these vibrant shades of coral-red. I’m not a huge fan of nautical themes, but I really love this combination! Great inspiration, as always. On another note, I was so shocked to read so many of the negative comments posted yesterday. I am very sorry people feel the need to be hurtful. You always handle yourself with amazing grace. Just know that you have so many positive followers who look forward to what you share everyday!! love your pics! nautical is such a classic style! I love that Tory Burch bag! I have been really into cross body bags lately and actually just listed them among my “mommy essentials” in a recent blog post. I am so into all things nautical, so this bag is going on my wish list ASAP! Love the bag and the sandals!! Very cute outfit! I love the color of the sweater! Great picks! I’m really loving the striped tory burch bag but I ADORE the red katespade bow bag! Simply cute! Love the watch and the sandals! I’ve been a huge fan of Pink Peonies since pretty much the beginning (for a little over 2 years), and you are actually one of the bloggers who inspired me to start my blog (a faith & mama blog). I’m so in awe of all that you do and how far you’ve come! Thanks so much for reading and supporting all these years!! Thank you! You are such a doll!